LA Imaging offers Orthodontics Records as part of a pre-treatment necessity. Pre-treatment records are important to determine facial growth patterns, confirm a diagnosis, and to plan a treatment. These Orthodontic Records may be taken more than once throughout the course of treatment with subsequent records taken to compare to initial records and to measure treatment. 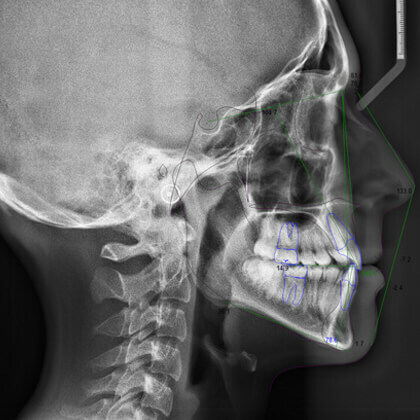 Orthodontic Records includes lateral ceph, panoramic projection and digital clinical photography and can also include digital study models as an option. Orthodontic Records includes in depth diagnosis for our patients, so they know exactly what is going on with every procedure as well as through recommendations. LA Imaging strives to see the improvements in our patients, that is why we ensure Orthodontic Records to keep our patients seeing their progress. Orthodontic Records are of the highest quality and detail oriented so there is no confusion or misread results. When receiving an Orthodontic Record, any allergies should be noted by our patients. The most common allergies that may complicate orthodontic treatment are to nickel, since it is found in most wires, and latex, which is found in some elastic materials. For patients that do experience an allergic reaction, options such as nickel-free titanium and ceramic brackets are available. In LA Imaging we keep track of the patients records and history as well, so we can maintain progress and final orthodontic surveys in our database as well as have the patients records available at all times for immediate access if needed. Orthodontic Records may be taken consistently throughout the course of treatment, so it is simple to measure the progress of treatment. If you are interested in learning more about Orthodontics Records we offer or want to make an appointment, contact us today!